The paper just published in Tentacle by Salvador et al. (2013a) appears to be a summary of a larger paper in the Journal of Natural History (Salvador et al., 2013b). The paper presents useful details on the terrestrial malacofauna, with redescriptions of all taxa and good figures. Unfortunately, no living material of these species could be obtained. Salvador, R.B., Cunha, C.M. & Simone, L.R.L., 2013a. The pulmonate snails of Trindade Island, Brasil. –Tentacle 21: 38-39. Salvador, R.B., Cunha, C.M. & Simone, L.R.L., 2013b. 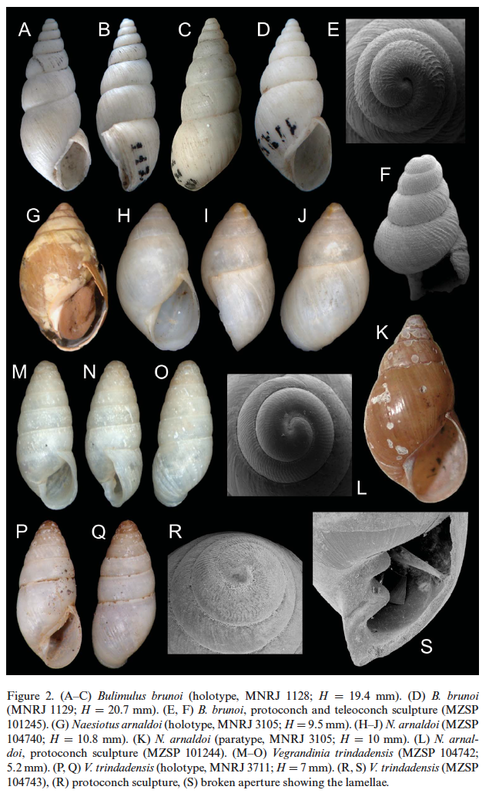 Taxonomic revision of the orthalicid land snails (Pulmonata: Stylommatophora) from Trindade Island, Brazil. – Journal of Natural History 47: 949-961. This entry was posted in Uncategorized and tagged brazil, bulimulidae, subulinidae on April 2, 2013 by bramb.